In October 2010 Vimeo rolled out Couch Mode, a new feature that made it easier to watch full screen videos from the streaming service while sitting on your couch, today Vimeo announced some rather impressive improvements to that service. The first big announcement is that the program now works in all browsers, previously only Safari and Chrome users could take advantage of the feature. Tablet support is also available for Vimeo Couch Mode which means iPad and Android tablet users can take advantage of the improved output. The system also now offers the ability to browse users, Albums, Channels and Groups. The former version only gave users the ability to watch videos they have “liked” or chose to “Watch Later” along with inbox videos and Staff Picks. Couch Mode users will also appreciate the ability to use global search by simply typing at which point the search box will automatically appear. Finally the program is now context-aware allowing users to click on Couch Mode and see other videos from the channel or group while viewing their video in full screen mode. 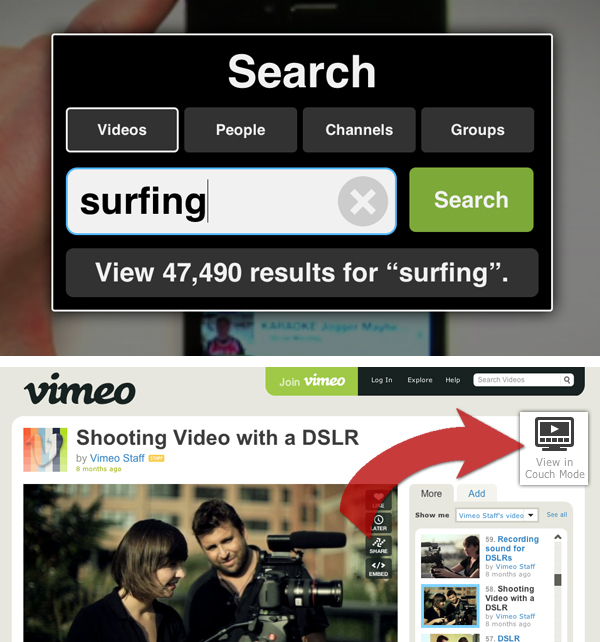 Give Vimeo Couch Mode a try today and let us know what you think of the new features.